The art of growing bonsai trees can be traced back to ancient China more than 1,000 years ago. The process first began when gardeners would grow a single species of tree in a small pot. Over time, the trees’ trunks would grow into gnarled and twisted shapes that often resembled animals or dragons. This sparked a mystery and legend, giving the bonsai an almost magical feel and appearance. Soon, the art of bonsai spread to Japan, where many Zen Buddhists enjoyed growing, cultivating, and pruning them into beautiful shapes. Today, bonsai has become a worldwide sensation and an enjoyable hobby in which many people take part. The process of both growing and caring for bonsai is a delicate one, and it takes a special technique to ensure that the trees are growing and being cared for properly. When looking for a bonsai tree, keep in mind that there are two basic types: temperate and tropical. A tropical bonsai tree will not survive in very cold or freezing temperatures, so during those times, it must be kept warm. A temperate bonsai, however, can thrive in colder weather and can be an outdoor tree if you choose. Tropical bonsai are not recommended for indoor use, so you should be sure you live in a region where it can still live outside when the weather cools down. There are many different styles of bonsai, and these are mostly based on the leaves and trunk and their colors, sizes, and shapes. Take a look at several different bonsai species to decide which one will suit your needs. Research what kind of environment, fertilizer, and soil they prefer before making a final decision so that you can ensure that your tree is happy and healthy. When caring for a bonsai, the trimming and pruning process is of the utmost importance. These tiny trees need constant attention, and the trimming and pruning process not only give them their own unique shape and style, but it is also essential for the trees’ overall health. There may be small weeds that grow in the soil at the base of your bonsai. Be sure to remove these upon first sight. 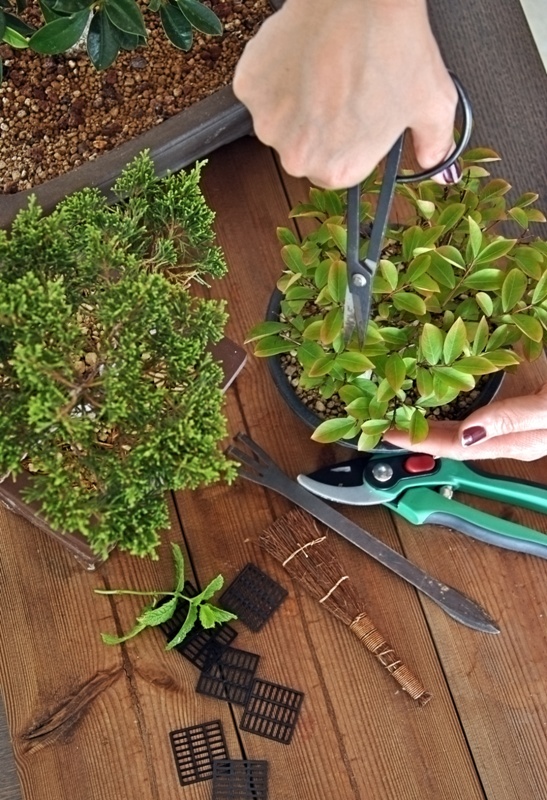 Cut back overgrown or rotting branches using pruning shears. This should be done throughout the year to ensure that the tree maintains its natural shape. Also, remove any dead stubs of the tree. You can cut back any branches that look awkward or do not fit the desired shape you are seeking. When it comes to pruning the leaves, this should be done delicately and only during the spring and summer months so that the tree can recover and grow new leaves. You can also simply pinch back the leaves you want to remove with your fingers to get the desired shape. If you look at bonsai, you may notice that each one has its own unique shape and style. This is because the owner of the bonsai has worked hard to develop their own personal style and technique for both caring for and trimming the tree. There are several different forms of bonsai care that can cause them to look a certain way. Each one basically looks exactly like it sounds. The formal upright style makes the tree look just like a miniature version of its tall counterparts, almost like an exact replica of a large outdoor tree, but in much smaller form. The informal upright style is also an upright look, but its branches are more wiry and wild, and it does not have a tight, perfectly straight shape. A slanting bonsai simply leans more towards one side. The branches and leaves may appear to be blowing in the wind coming from one direction. A semi-cascade bonsai also slopes, but its branches and leaves do not typically reach below the bottom of the pot. A regular cascading bonsai, however, slopes much further and extends way past the pot. These types of bonsai usually must be placed on stands or pedestals so the tree can slope fully downward. Bonsai trees require a lot of special care. Keep in mind that the smaller the pot used, the more frequently the tree may need to be repotted. In spring, most bonsai trees should be watered at least once per day. Due to their small size and small pots, bonsai require fairly frequent watering. Take care to only water the dirt and try to keep the leaves dry. You may fertilize your bonsai, but be sure not to overfeed it, and research which type of fertilizer your particular species will respond to. You can add wire to the branches of your bonsai to help encourage it to grow in a particular direction if you choose. Make sure your bonsai gets plenty of irrigation and air flow in the pot, and of course, be sure to trim and prune it regularly.